I have never understood it until recently. And I am not sure I have understood it fully either. But, there has always been something about the Indian cricket fan that used to irritate me. And in saying this, I am not excluding myself from this set of fans. Previously, I couldn’t quite understand what it was. But recently, after having moved back to India, I am beginning to understand what it is to be an India cricket fan! There is so much imperfection around us in India. Our buildings are mostly decaying. Even new buildings decay right before our eyes. We build airports but two years later, there are spit stains on the walls. We build, forget to maintain, neglect and forget everything we construct — unless someone hits us on the head over it! There is chaos and anarchy everywhere you look. Planes should not land amidst such chaos. Surely, not. But planes do land. Our buildings, however old and decayed, stay upright… Mostly. We cope with the imperfections around us. Governance in public life is almost non-existent; people in public life make a mockery of the people they govern. The construction of a metro line, about 20 years overdue, will take 10 years to complete and will bring the city to a grinding halt while it happens. Corruption is so endemic that there is more cynicism than trust. Government offices have masses of paper and masses of people that sip tea and coffee and (it would seem) do nothing. But laws do get passed. The income tax department collects taxes. The banks function. Under the weight of tonnes of paper, people do sign masses of forms — in triplicate, no less! Things get done… Mostly. We cope with the imperfections around us. Few roads are ever complete. Most of them have open and stinking drains, random blocks of stone or concrete are left behind — post-construction — in the middle of the road. There is always a pile of rubble to navigate around. If not that, there is a pile of garbage or multi-coloured optic fibre sticking out of unfinished pavement works. The pavements are mostly incomplete. So walkers spill on to the streets, causing more traffic chaos. Most roads are not sealed end-to-end, causing more dust to swirl around. And roads around us are decorated with pot holes rather than bitumen. Roads have little or no drainage. A minimal downpour leaves us yearning for a yacht instead of a car or a bike. And for those of us that walk, the spokes of our umbrellas point more to the skies than to the ground when it rains! Even our umbrellas are imperfect. But we do get from A to B. We do use the roads. We do get to work and back… Mostly. We cope with the imperfections around us. Our buses, which seem to be permanently on their last wheels and defy fundamental laws of physics! They should not be allowed to move. But they do. They too cope with the imperfections around us. Our people defy time! None of us are on time for anything. Our watches show different times! Even the clocks on two adjacent government buildings show different times! But we cope. Time is also imperfect and we cope with it. Our phones always ring. Even in a classical music concert in which the performer is striving for that perfect pitch. But we answer our phones. Talk loudly. The performers continue… And learn to cope with the imperfections around them! We talk loudly and can barely hear each other amidst the cacophony of noises around us. We have a need to be heard over the blaring loudspeakers and the car honks. But we listen to each other… Mostly. We cope with the imperfections around us. Our queues do not work although there is a queue for everything! Our queues are so haphazard that statisticians and mathematicians who study queuing theory need better models to understand how queues work in India! A professor I know at a famous Indian institute is studying “Non-standard Tirupati queues with chaotic service”. But we do “queue” for everything from tomatoes, to bread, to railway tickets to airline tickets to withdrawing cash. We expect that, by joining our body to the body of the person in front of us, we will somehow, magically, reduce the queue-size by one! But, even through these imperfections, our queues seem to work. We cope with the person behind us that has stuck their smelly body to us so that they may live their hope that they will reach their destination quicker through their irrational coping mechanism! We have learned to cope with the imperfection in our queues! Everywhere you look, there is trust deficit, cynicism, unnaturally unhealthy competition, a growing chasm between the haves and have-nots and a growing hunger for the haves to have more. There are imperfections around us. Everywhere you look there are imperfections. So much, that we expect our heroes to make up for the gaps. We expect our heroes to be what we cannot be. We want them to help us fill the gaps that we cannot fill. They help us cope with the ill-placed fibre-optic cable that almost always trips us as we run to jump onto that bus that always seems to be full and almost always doesn’t want me on it! We expect our heroes to straighten our umbrellas. We expect them to help us cope with our queues, in which we thrust ourselves and our bad body odour onto the person in front of us! That is why it is hard to be a cricketer in India. Not only do they have to score runs or take wickets, they have to straighten our umbrellas before their contributions are recognised. They help us cope with not only the imperfections around us; they help us cope with the imperfections within us too. If they cannot be everything that is not, they just cannot be our heroes. Our heroes cannot be imperfect. It is a pity Rahul Dravid cannot bowl. If he could, perhaps he would have been a hero in his own country! 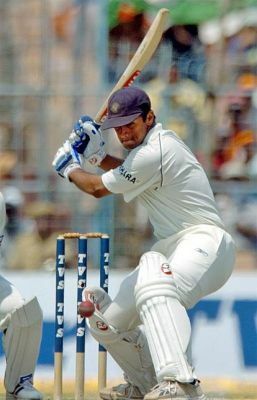 This entry was posted in Cricket, Current, India and tagged Cricket, Dravid, India, Team India. Bookmark the permalink. Bloody lovely post. Really great writing. I notice the cocky Indian fans have gone very quiet on blog sites and forums of late. And why not…how on earth do you make excuses for a 4-0 bunch of pea hearts. But it’s not all lost. Apparently The Netherlands might be able to use you for a bit of practice before they next play Ireland.